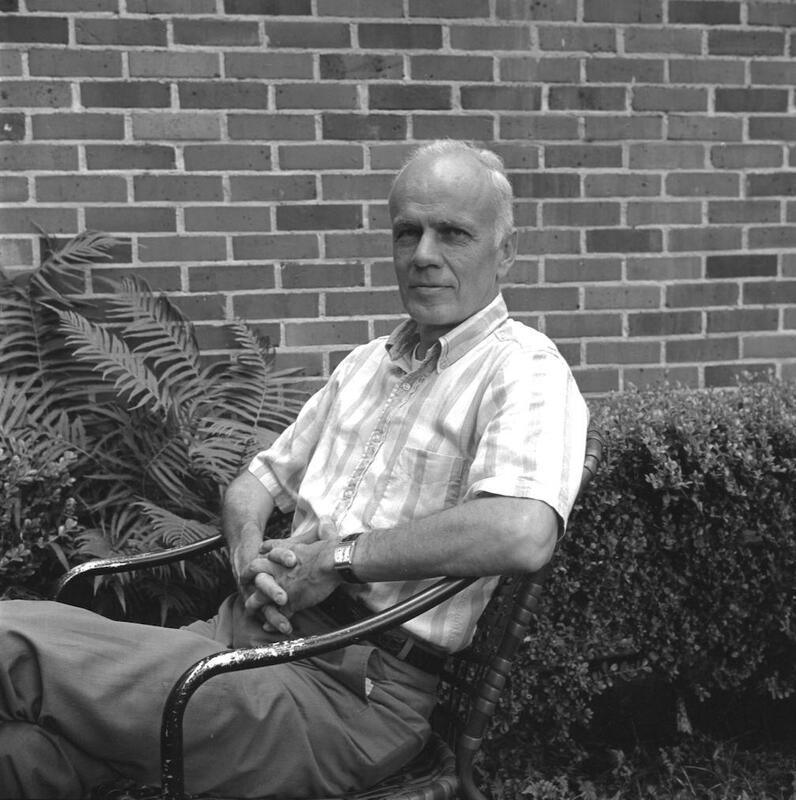 In a caustic, funny, and illuminating self-interview published in 1977, novelist Walker Percy commented, “Of all the things I’m fed up with, I think I’m fed up most with hearing about the New South.” Although Percy professed exhaustion with the subject, the New South—particularly the Sunbelt South, in which aging plantation manors and gleaming new suburbs coexisted uneasily—remained at the center of his work throughout his career. Of course, Percy was chiefly fed up with tired clichés about the South, New and Old. In his own writing, including five novels and three works of nonfiction, Percy offered a challenging and idiosyncratic perspective on the South, race, religion, language, and the alienation of modern humankind, a perspective informed by his Mississippi Delta adolescence, medical training, fascination with philosophy, and devout Catholicism. Born on 28 May 1916 in Birmingham, Alabama, Percy led a life that was marked by loss. His father, LeRoy Percy (nephew of the US senator from Mississippi by the same name), committed suicide in 1929; his mother, Martha Susan Phinizy Percy, died in a car accident two years after moving with Percy and his brothers to the Mississippi Delta town of Greenville in 1930. These deaths haunted Percy throughout his life: in particular, his struggle to understand his father’s suicide is evident in his novels, The Last Gentleman and The Second Coming. Percy remained in Greenville, home of his lifelong friend and fellow author, Shelby Foote, and of Percy’s second cousin, William Alexander Percy, who adopted Walker Percy and his brothers following their mother’s death. “Uncle Will” was a prominent Greenville citizen and was perhaps the single most influential figure in Percy’s life. A poet, lawyer, and aristocratic planter, Will Percy is most famous for his 1941 memoir, Lanterns on the Levee: Recollections of a Planter’s Son, a stoic elegy for a doomed Delta lifestyle in which, he believed, agrarian values, a code of stoic honor, benign racial paternalism, and good manners worked together to create a stable social order. Walker Percy’s fiction often grappled with his adoptive father’s complicated legacy, featuring protagonists who are the sons of once-prominent but fading families adrift in a South where traditional values no longer suffice to explain perplexing new realities. In 1948 the Percys moved to Covington, Louisiana, where they reared two daughters. Percy continued to pursue his vocation as a writer, publishing essays on language, religion, philosophy, and literature, many of which are collected in The Message in the Bottle (1975) and Signposts in a Strange Land (1991). He published his first novel, National Book Award winner The Moviegoer, in 1961. The novel’s protagonist is a disaffected young New Orleans man who, dissatisfied both with contemporary society and with his family’s archaic code of stoic honor, ultimately finds hope in the possibility of Christian grace. The Last Gentleman (1966) tells the story of Will Barrett, a southerner taking refuge from the ghosts of the past in New York who finds his return to an unrecognizable South complicated by his comically failed attempts to adhere to his father’s paternalist, aristocratic mold and by his gradual recovery of the repressed memory of his father’s suicide. Love in the Ruins (1971) takes place in the apocalyptic near-flung future of 1983, when America has disintegrated into racial and political chaos and teeters on the brink of ruin. The novel chronicles the misadventures of Dr. Tom More, whose scientific hubris has led him to invent a device he believes will save humankind from itself by healing the Cartesian split, diagnosing and curing metaphysical ills such as depression and paranoia by altering an individual’s brain chemistry. Lancelot (1977) is the first-person account of a cuckolded husband who murders his wife and a visiting film crew and burns down his home—an antebellum mansion and tourist attraction—and dreams of leading a Third American Revolution to restore the values of the Old South. The Second Coming (1980) is a sequel of sorts to The Last Gentleman in which Will Barrett, now a middle-aged widower still struggling with the memory of his father and contemplating his own suicide, sees the presence of God and the possibility of redemption in his love for escaped mental patient Allison Huger. Percy brought together his interests in semiotics, psychiatry, philosophy, and popular culture in 1983’s comic, complicated Lost in the Cosmos: The Last Self-Help Book, an attempt to understand the role of language in the creation of the self. Dr. Tom More returns in Percy’s final novel, The Thanatos Syndrome (1987), which explores the hollowness and corruption at the heart of scientific attempts to perfect humanity. Tom and his cousin, Lucy, uncover a plot to contaminate their parish’s water supply with an isotope that enhances human brainpower but that also suppresses the conscience and turns people from sovereign individuals seeking God into highly suggestible organic machines. Percy died of cancer at his Covington home on 10 May 1990. Acknowledged as one of the most significant figures in post–World War II southern letters, Percy left behind a unique and challenging body of work that continues to influence contemporary southern writers such as Richard Ford, Josephine Humphreys, and Padgett Powell.